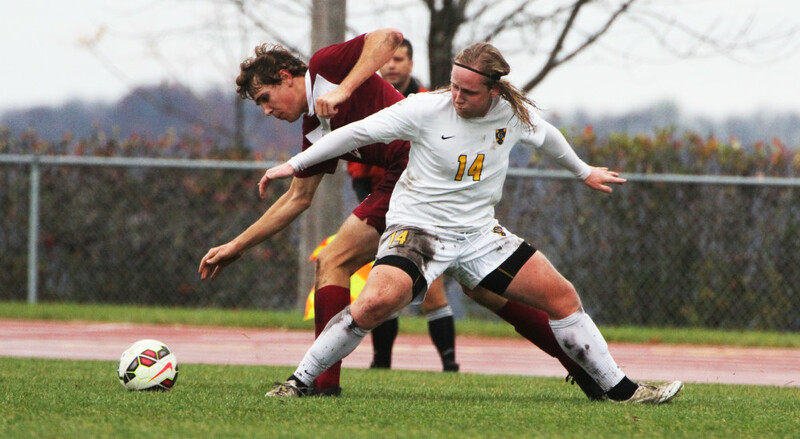 SAINT PETER, Minn. – Playing in its final game of the 2015 season, the Gustavus Adolphus College men’s soccer team concluded its year on a high note, as it earned a 2-1 victory over Hamline University on Saturday afternoon at the Gustie Soccer Field. The win pushes the Gusties’ final record to 9-5-3 overall and 3-4-3 in the MIAC, while the Pipers finish their regular season at 7-8-2 overall and 5-4-2 in the MIAC. As they did in their last game against Concordia, the Gusties again scored early, this time with Henry Brose (Jr., Hudson, Wis.) finding a well-placed cross from Matt Murakami (So., Eden Prairie, Minn.) for a shot that sailed past Piper goalkeeper Dean Isaacson just six minutes in to give the Gusties a quick 1-0 lead. However, the rest of the half would remain scoreless, with both teams trying to find their footing on a field that was still drenched from a late Friday evening rain and a full season of play. In the second half, Hamline’s hero from its previous game against Bethel, Abbai Habte, was able to put a ball past Gustie ‘keeper Matt Bateman (Fy., Savage, Minn.) at 54:49 to tie the game at 1-1. From that point, Gustavus was able to center several crosses, but was unable to convert until a Piper foul at 78:06 gave the Gusties’ Charlie Adams (Sr., Stillwater, Minn.) a free kick. Adams sent the kick sailing towards the left side of the goal and fellow senior John Fox (Maple Grove, Minn.) was able to get his head on it and put it past Isaacson for his first goal of the season, which proved to be the game-winner in a 2-1 victory. Gustavus led the shot count 10-6, including a 6-4 mark on goal. The Gusties also had six corner kicks compared to the Pipers’ five. Bateman earned his fourth win of the season between the posts for the Black and Gold, as he made three saves and allowed just the one goal.